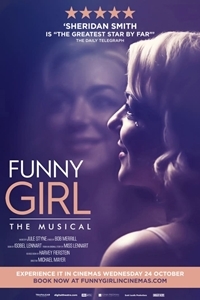 Funny Girl: The Musical () Runtime: 2 hr. 40 min. Funny Girl first opened on Broadway on the 26th March 1964 at the Winter Garden Theatre. It later transferred to the Majestic Theatre and The Broadway Theatre and closed in 1967.The original book was written by Isobel Lennart, music composed by Jule Styne and lyrics written by Bob Merrill. The musical is semi-biographical, based on the life and career of Broadway star, film actress and Comedienne Fanny Brice. Lennart originally named the book for the show My Man; this was changed to Funny Girl during the creation of the production. Ray Stark, Brice's son-in-law via her daughter Frances, produced the original version of the stage show.